Power and grace. 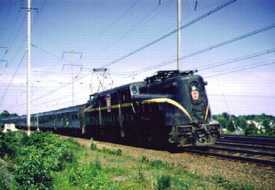 E-units on the front end of streamliners in the 1960s had both. On the left is the California Zephyr cutting through foothills not far from its destination in Oakland on Western Pacific rails in 1968. On the right is UP's City of Los Angeles-Challenger near Riverside, California, a year later. Around the holidays we think of miniature trains. I had one of those little Lionel figure eight sets that wound around the Christmas tree when I was a kid. But for many of us the closest to 'small' we get are short lines. On the left is a dramatic shot, taken in 1982, of a Wolfeboro Railroad run between Wolfeboro Falls and Wakefield, New Hampshire. A successful line that became the victim of a failed buyout a couple of years later, the Wolfeboro was for many years a real community centerpiece, and it gave my family and me wonderful ambiance for the almost 20 years we camped near its tracks. On the right is probably the closest thing to an Amtrak connection among remaining short lines. This 1998 photo is of a Santa Fe Southern train in the Santa Fe, New Mexico, about ready to take an 18 mile run south to Lamy, where it is possible to connect, twice a day, with the Southwest Chief. The coach is from the now defunct Jersey Central. With Acela just up the track -- or around the bend -- it's good to remember that the NE Corridor has been the site of more than a little innovation and experimentation over the years. On the left is the Pennsylvania Railroad's Afternoon Keystone, a low-slung lightweight articulated train, photographed behind a GG1 at high speed in Metuchen, New Jersey, back in 1962. 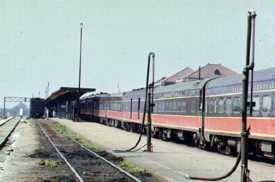 I never rode the Keystone, but I'm told its coaches, parlor and dining cars bounced around quite a bit a la Amfleet. 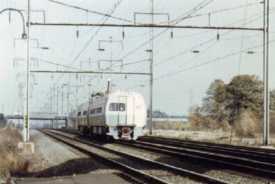 On the right is a USDT-Penn Central Metroliner test run, photographed in North Brunswick, New Jersey, in 1968. Here are two photos of Amtrak's City of New Orleans, photographed on a steamy summer day in Champaign, Illinois, in early June 1971, a month or so after Amtrak's birth and the end of the Illinois Central's fabled long-distance service between Chicago and New Orleans. The photo on the left was a real stretch for my extreme telephoto -- and digital imaging software -- but as the new century begins both shots are fitting reminders of those early days before, on the exterior at least, there was any Amtrak identity. Famous in song and as a conveyance for generations of poor white and black Southern migrants to Chicago and its industrial appetites the City of New Orleans was accompanied on the route by the all Pullman Panama Limited, which served a different clientele altogether. Amtrak reduced the run to one train and, for awhile, it took the name of the luxury varnish before several years of languishing on an irratic schedule as the pre-Superliner City of New Orleans.